A Bond audio book from 2012, read by Rosamund Pike. The Spy Who Loved Me was the tenth Bond novel by Ian Fleming and published in 1962. 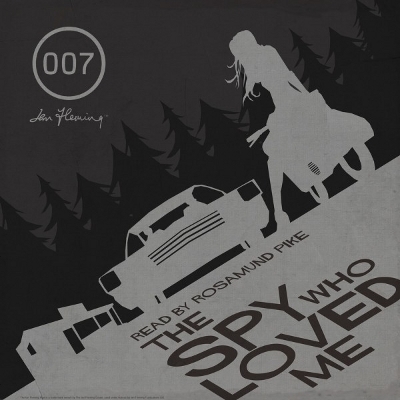 Fleming didn't care much for it himself and gave instructions that only the title was to be used in any film version and - generally - The Spy Who Loved Me is not regarded to be one of the best books in the series. It does have fans though and the rather polarising nature is probably best explained by this being a different type of Bond book that found Fleming in experimental mood. In The Spy Who Loved Me, Fleming departs from his usual structure and the story is told first person by his heroine Vivienne Michel. Vivienne is a French-Canadian on the run from an unhappy and complicated past who ends up at a lonely job at the Dreamy Pines Motor Court, a motel in the remote Adirondacks. While a storm rattles outside, Vivienne has to close the motel down and look after the place but she ends up in big trouble when a pair of criminals named Sol 'Horror' Horowitz and Sluggsy Morant turn up with orders by their boss Mr Sanguinetti to burn the place down for insurance purposes. Vivienne is beaten and held hostage and things look rather bleak. Until that is a mysterious man with a flat tyre on his car suddenly turns up at the motel. His name is James Bond. The difference between this and the other Bond audio books is that this story - as told from a female perspective - is a chance for an actress to boot Simon Vance or Rufus Sewell into touch and narrate a Bond novel for a change. Rosamund Pike proves to be a fine choice and throws herself into the task. Her voice is suited for the confessional nature of the character and she's good too when she has to do Bond and all the villains. If they ever bring back Jackanory, Pike would be a good person to hire. Bond only appears in the book for the third act. The first 50 or so pages of The Spy Who Loved Me consist of Vivienne reflecting on her tangled life and ups and downs. The second act has the arrival of the villains before 007 enters the fray for the final act. The first act is not Fleming on the firmest footing but it works well being read to you by Pike and you at least admire the author for trying something new and taking himself out of his third person narrative/megalomaniac holds the world to nuclear ransom comfort zone. When he wrote the book Fleming was apparently becoming slightly tired of churning out Bond novels and wanted to tinker with his formula. Fleming didn't like the idea that the Bond books were seen merely as entertaining pot boiler thrillers and was seeking a bit more critical recognition for his literary endevours. It takes quite a while for anything of note to happen in the story but there is tension generated when the villains show up and Bond arrives. The backstory of Vivienne does flesh her out as a character and make us feel like we know her quite well. Even by Fleming standards, this entry is quite sadistic at times with Vivienne taking a battering from Sol and Sluggsy. I think The Spy Who Loved Me often works better than other famous 007 works as an audio book because there less distracting diversions. You don't have an uneccesary passage about the history of marmalade or something as Fleming was prone to do. The atmosphere of the novel - remote mountainous location, the telephone is out, wild storm etc - is great for an audio adaption and nicely conveyed. These are not your typical Bond villains but nasty all the same and somewhat grotesque in the Fleming fashion. Sluggsy has an absence of hair anywhere on his body and very bloodshot eyes and Sol 'Horror' has steel-capped teeth (clearly the inspiration for 'Jaws' in the completely different film version). The story does have a great moment when 007 (who is returning from a mission and has stopped here by accident with a flat tyre) is asked 'Hey, limey. What's your name?' by one of these unhinged characters. 'Bond, James Bond,' comes the reply. The thing that makes this moment enjoyable is our knowledge of James Bond and what he does for a living. Sol and Sluggsy think this is some sap who has broken down and can be bumped off easily. One nice touch in the story is that Bond talks about his last mission. This was a mission to capture a SPECTRE agent and involved no small degree of cunning. This is a nice adaptation on the whole and the fact that we are viewing Bond here through somebody else's eyes rather than Fleming's third person narrative is effective, making him seem like more of a mythic character. Stay tuned after too for some extra thoughts from Pike on the story and how it affected her.